Miami Florida. 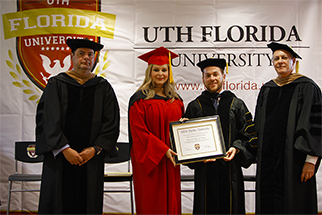 On January 20, 2018, the commencement ceremony for the first graduating class of UTH Florida University at the Intercontinental Hotel in Miami, Florida. !What are you waiting for! The time has come for you to start your path to success, give yourself the opportunity to become the best professional you can be with UTH Florida University, and be part of the successful people. Edwin Rodriguez y Javier Castillo son muestra de cómo esta institución de educación superior ha ayudado a tantos latinos en alcanzar sus sueños. UTH Florida University utilizes Innovative Technology specifically designed for on-Line Education. We employ the case method and materials developed by Harvard to insure High Quality Education while offering Flexible Schedules and Affordable Tuition Costs to be within everyone’s reach.